From concept to reality; our approach to making the world that bit better than when we found it. It’s all very well saying we are a bunch of techies wanting to make a difference. Don’t get me wrong, we are, and saying this out loud is a great place to start but how does this become a tangible, real world concept? As a company we want to do great work that we are proud of and if it makes a positive difference to our community then all the better. We have even worked it into our mission statement so that every member of the Hive team is empowered to steer the ship in that direction. We exist to make good things happen. Hive IT’s mission is to use the right tools & technology to make positive changes to the world we live in. But how do we do this whilst also balancing the needs of growing SME that is still, in what most would consider, its “early days”? Tech4Good doesn’t have to be about saving the world in a single project. Ok, so we all dream of developing that one bit of software or designing an amazing app that will end world suffering (a little unrealistic we know, but we dream big here at Hive IT) and you know what, I’m proud of our approach in this area. There are so many struggles being faced by our neighbours, our local communities that could easily fall off the radar if not taken notice of. By tackling what could be perceived as the “smaller” issues, the proportionate benefit to those grass roots, community-led organisations will be more than can ever be quantified. Take a look at the training plan you have for your team, or even yourself. Wouldn’t it be great to be implementing that learning on a real project? Books and training courses are great, but I think most of us realise that our new skills don’t embed until we use them, in the real world. What if by using those new skills you could be making a positive difference to someone else’s world? This is why it makes complete sense to see up-skilling staff as an opportunity to do some Tech4good. This is exactly the approach we took working with Sheffield based mental health charity Sage Greenfingers, their website was a decade old and in desperate need for a refresh, we had a hungry designer looking to learn a new skill and an amazing team to support the process. 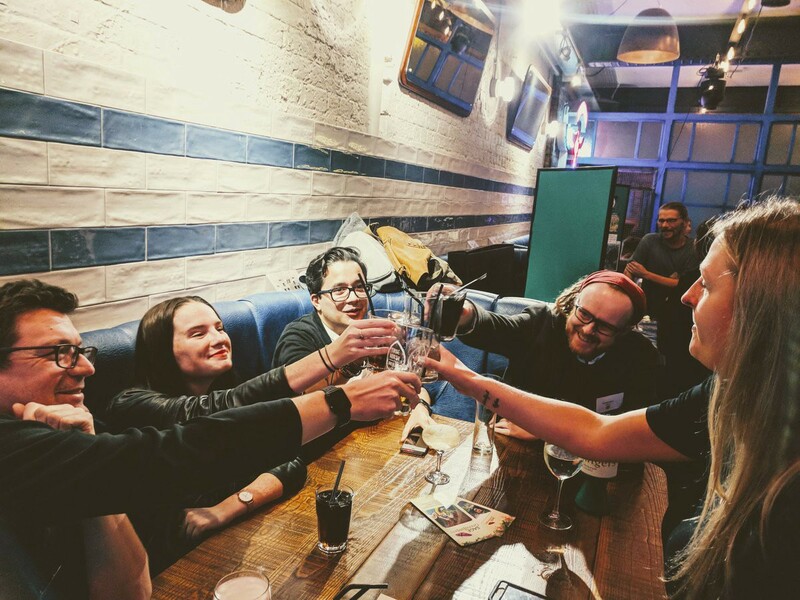 Having a plan for “downtime” or time in-between projects is not only a great opportunity to do some pro bono work, it’s also important for staff morale in general. Talk to any designer or developer, a couple of quiet days following the end of a hectic project is a great thing. But then it’s time to get their teeth stuck into something. They want to build, to create. We, like any other digital agency, face the age-old rollercoaster of feast and famine in terms of workload. So what if you were to have a list of not-for-profits or charities in your area that would kill for the talents of your team, even just for a few days? Isn’t that a more purposeful way to use that time between projects? Tech4Good or pro bono work in general doesn’t have to be reserved for those companies with a substantial corporate social responsibility budget. 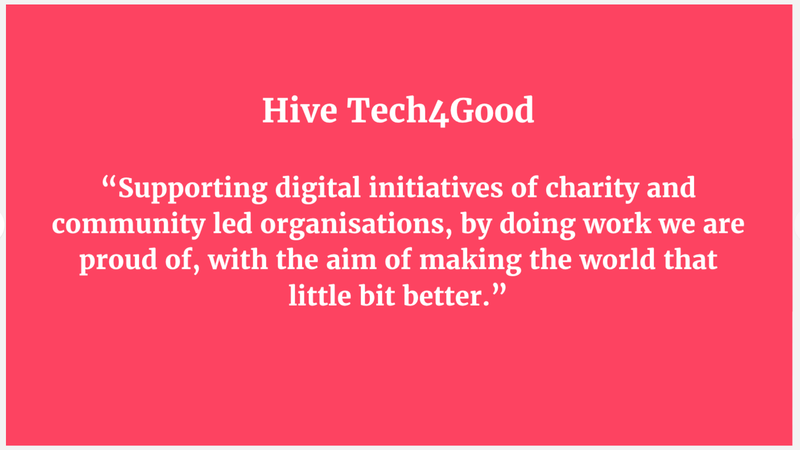 Those kind of funds are just not available to start ups or small to medium size businesses like us, but we have carved out a way to make Tech4Good a reality here at Hive. It’s become an essential part of who we are. Some years we will be able to do more of it, some years it might be less but it’s always at the forefront of our minds. A year into our mission, with some great projects behind us, we can proudly say we have made Hive Tech4Good a reality.